CARLISLE, Mass. - The year since Jeff Bauman was rushed in a wheelchair from the Boston Marathon, his legs ravaged, has been marked by pain but also by triumph: He's learned to walk on new prosthetic legs, he's gotten engaged and he's an expectant father. Bauman became one of the most powerful symbols of Boston's resilience after the April 15 attacks, immortalized in an Associated Press photo. He became a hero days later when he was able to help authorities identify one of two brothers accused of setting off pressure cooker bombs, killing two women and an 8-year-old boy and injuring more than 260 others. His memoir, "Stronger," comes out Tuesday. The past year has been a blur for Bauman, and he can't get used to the idea that this is his new life. "Right now, you know, it's kind of a challenge to put my legs on every day. I'm not used to it. It's something unnatural for me. But I think over time it will become more of a natural thing," Bauman, 28, told the AP in an interview at the home he shares with his fiancee, Erin Hurley. "At first I couldn't even wear them for 20 minutes. ... Now, I can wear them all day." Bauman was standing near the finish line with two friends, waiting to cheer on Hurley as she completed the marathon. He noticed a man who looked out of place in a crowd of revelers, and they exchanged a long stare. As Bauman describes him, he was "all business." Moments later, the two bombs exploded. Bauman found himself on the ground, his legs gone. He thought it was the end. 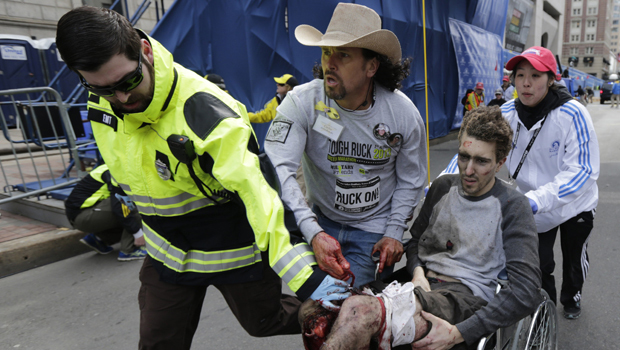 Suddenly, a man in a cowboy hat appeared: Carlos Arredondo. He lifted Bauman into a wheelchair pushed by Devin Wang, and they rushed toward the medical tents. They were joined along the way by Paul Mitchell, an emergency medical technician. "When someone looks that way, they've lost a lot of blood, and they're really close to being dead," Mitchell said. Thanks to his rescuers, Bauman lived. He was in surgery within 20 minutes. Soon after Bauman woke, he was able to provide a description of the man who was "all business." Authorities say it was Tamerlan Tsarnaev, who was killed in a shootout with police days later. Tsarnaev's brother, Dzhokhar, has pleaded not guilty and is awaiting trial. Bauman calls the brothers "weak" and says they wasted their lives. He said Dzhokhar Tsarnaev must suffer from knowing what he did, especially killing a child. "You can't tell me that that doesn't eat away at that kid every single day. It has to. It must haunt him," he said. "Or if it doesn't, it eventually will." Bauman has focused on healing. He lost his legs above the knee, making it harder to adjust to his prosthetics. He has made steady progress, and by March, he was walking with one crutch. He hopes to someday be able to walk without the crutches and to use the prosthetics all day without his legs getting sore. Sleeping was tough for him the first few months, and he still has nights when his mind is racing too fast to get any sleep. "I have bad days, days when I just don't want to do anything. Just kind of want to lay in bed," he said. "I don't want to see anybody today. There's days like that." Bauman is on leave from the Costco store where he worked before the bombing. He wants to learn how to drive again before going back, and he has a rigorous rehabilitation schedule that requires several appointments a week. He also feels he's not prepared mentally to return yet. For now, Bauman and Hurley are preparing for the baby, due July 14. They got engaged in February and tentatively plan to get married next year, Hurley said. Bauman admits he has some anxiety. "I'm kind of scared, I don't know. I mean, I just want to be able to be there physically when the baby's running around and going nuts," he said. They don't know yet if it's a boy or a girl. Hurley says Bauman is still deciding whether to go back to school or pursue other opportunities that have arisen since the bombing. "He can do anything he wants really. But all he wants to do is walk. I think that's a good goal for now," she said. "Plus, we have the baby coming. That's going to be a big project. Like a lifetime project." For this year's marathon, the couple plans to spend some time at the race, though Bauman admits to being apprehensive - not because he's worried it's not safe but because of his celebrity. "I'm kind of scared about that," he said. "I don't want to be mobbed and hoisted up in a crowd."